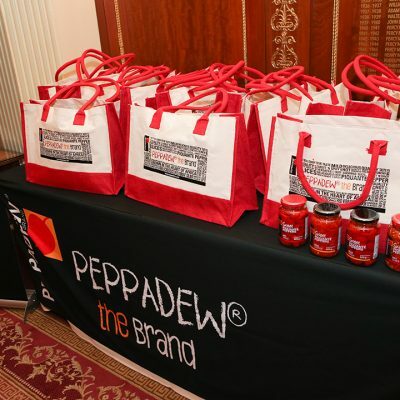 The lunch started with a champagne reception, sponsored by Peppadew. 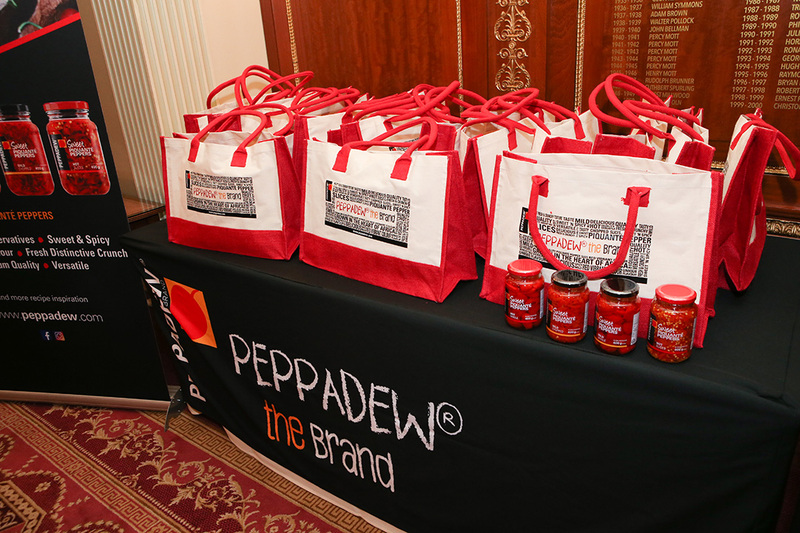 Goodie bags were distributed by Peppadew. 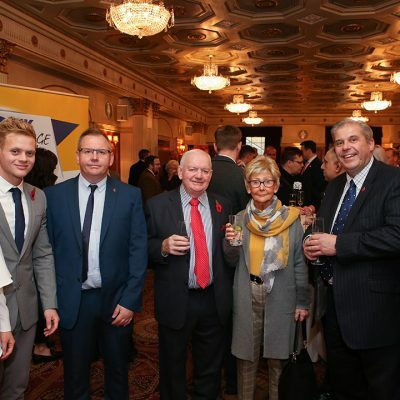 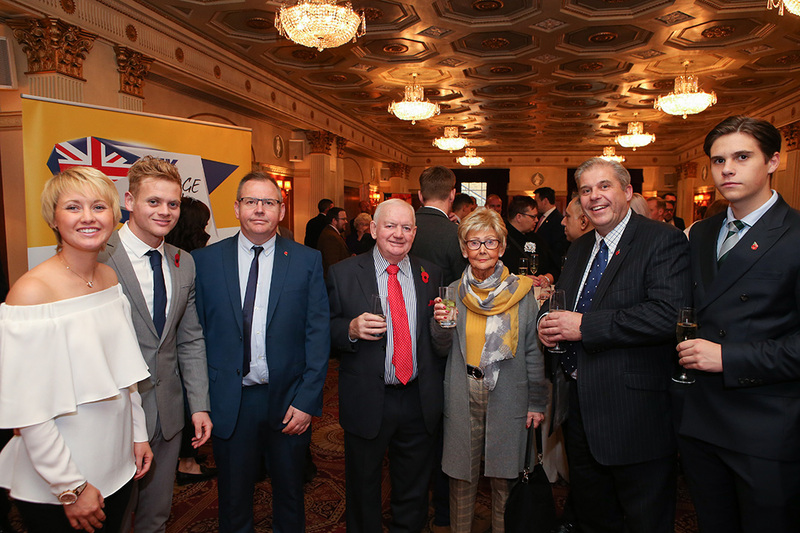 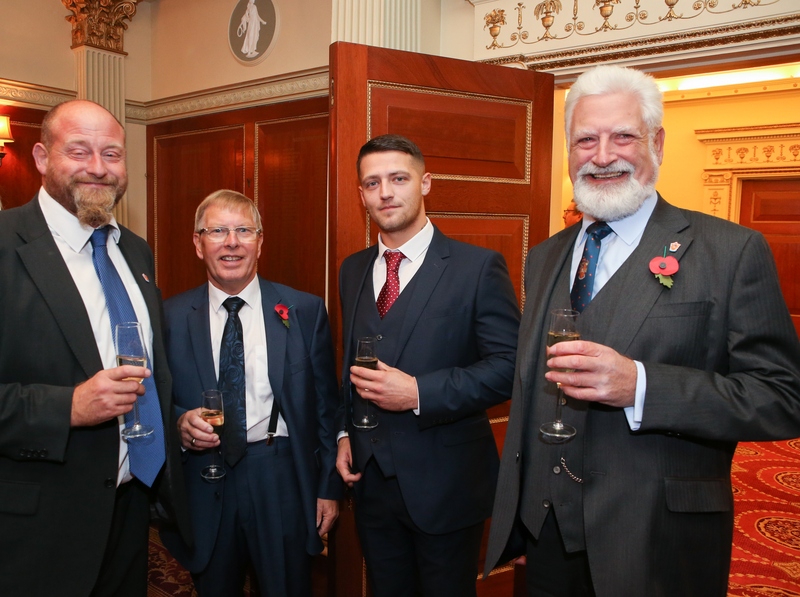 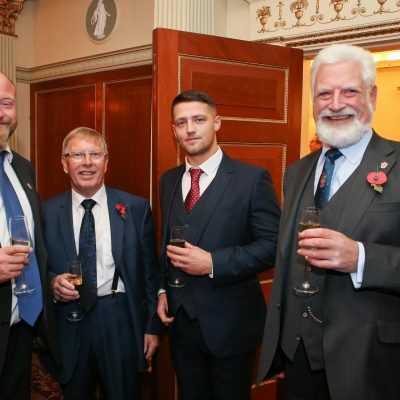 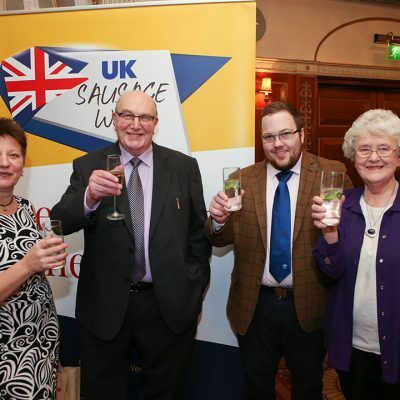 Graeme Sharp of The Scotch Butchers Club (3rd Right) together with fellow guests celebrating UKSW. 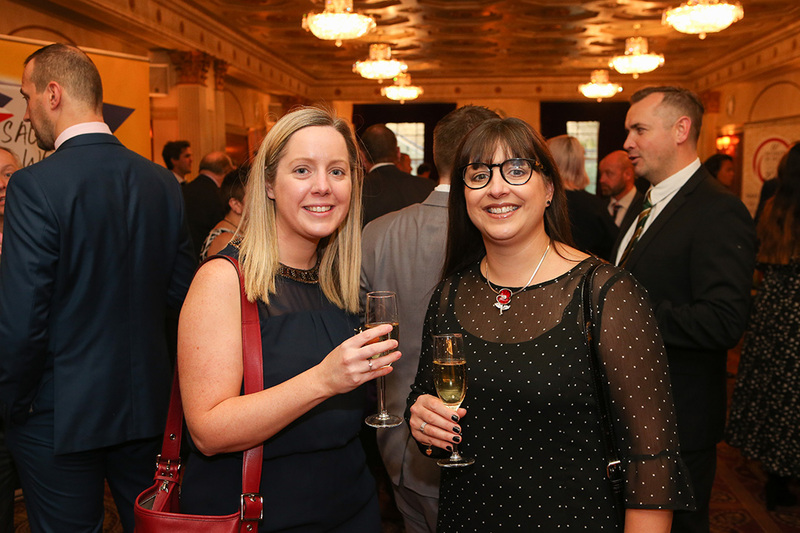 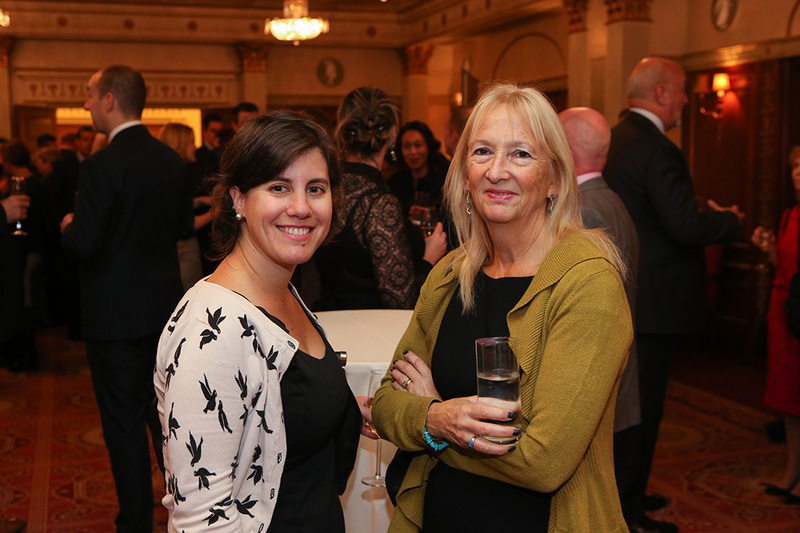 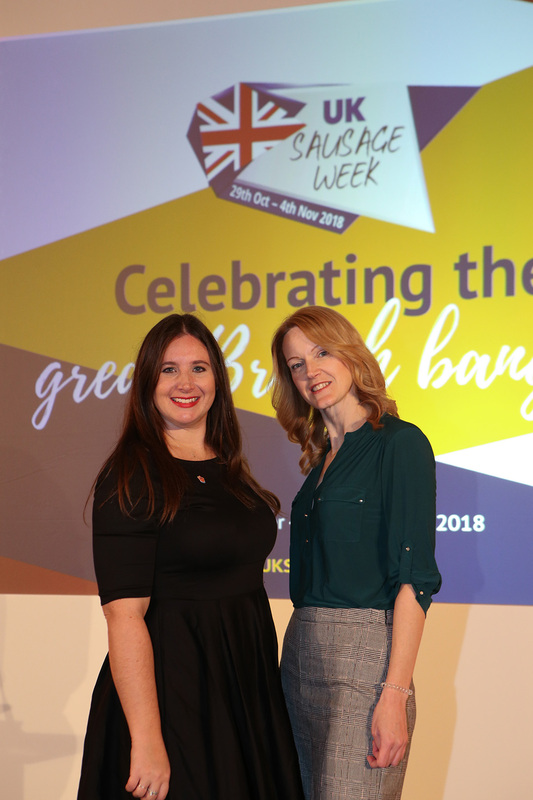 L-R: Meat Management editor Emily Ansell Elfer and UK Sausage Week awards organiser Emma Cash. 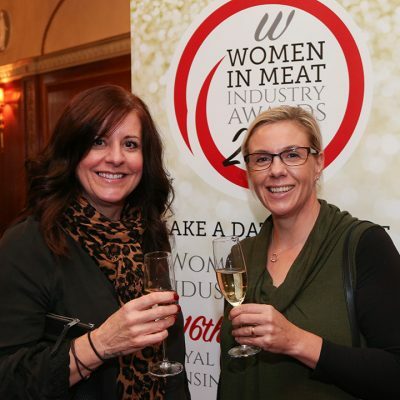 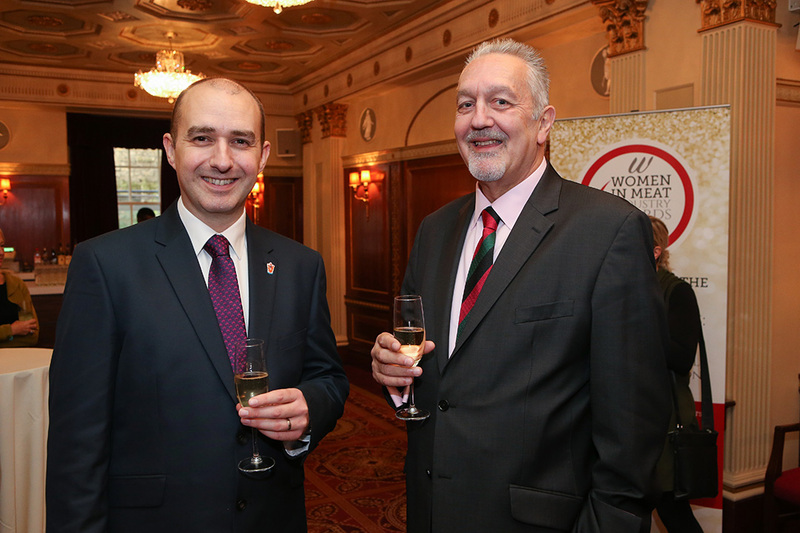 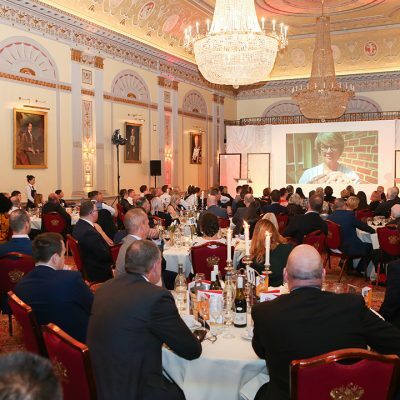 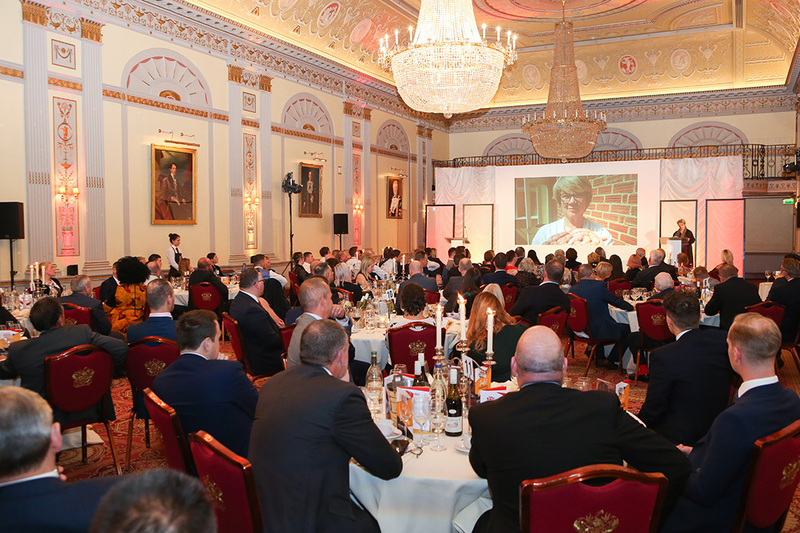 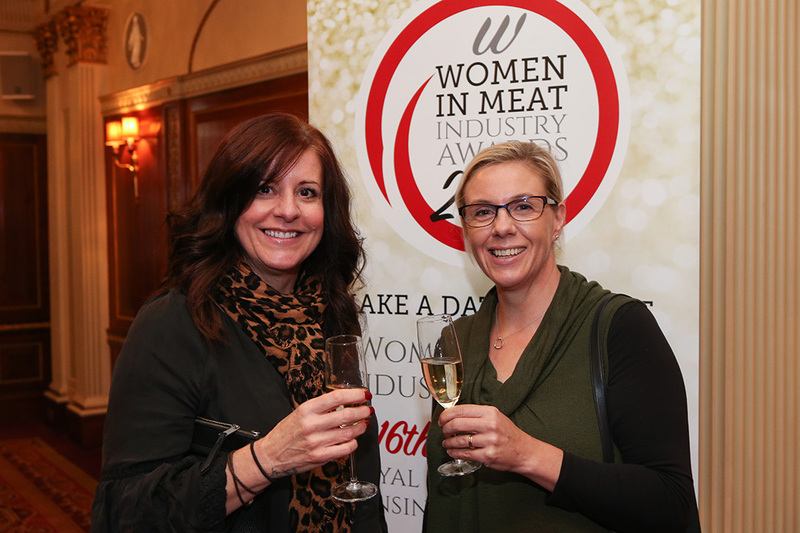 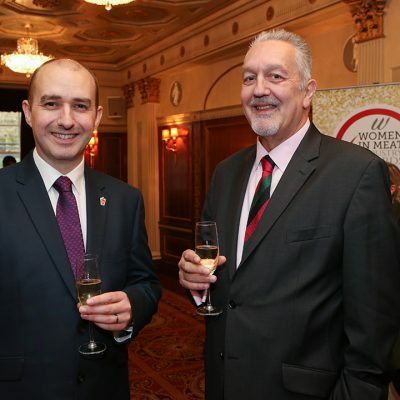 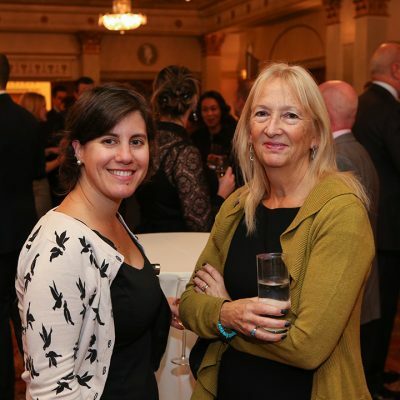 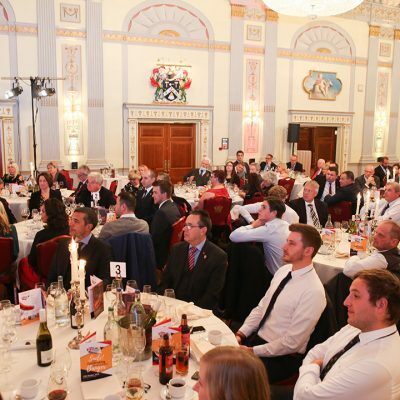 Our next special event on 16th November will be the Women In Meat Industry Awards - Who will win? 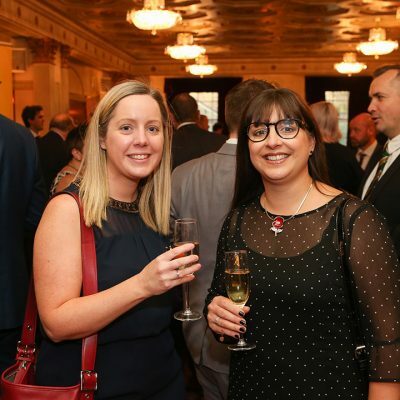 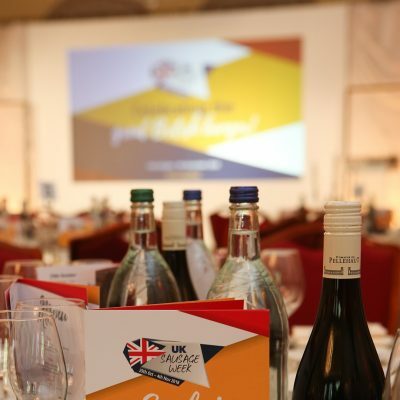 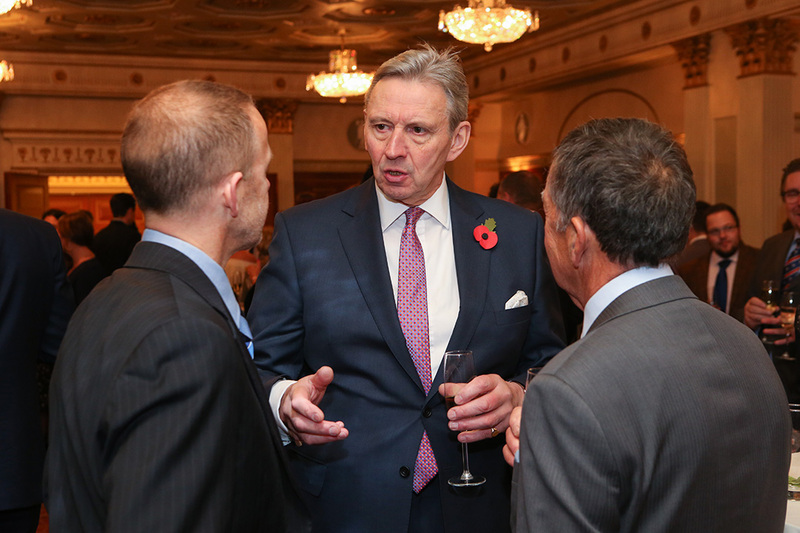 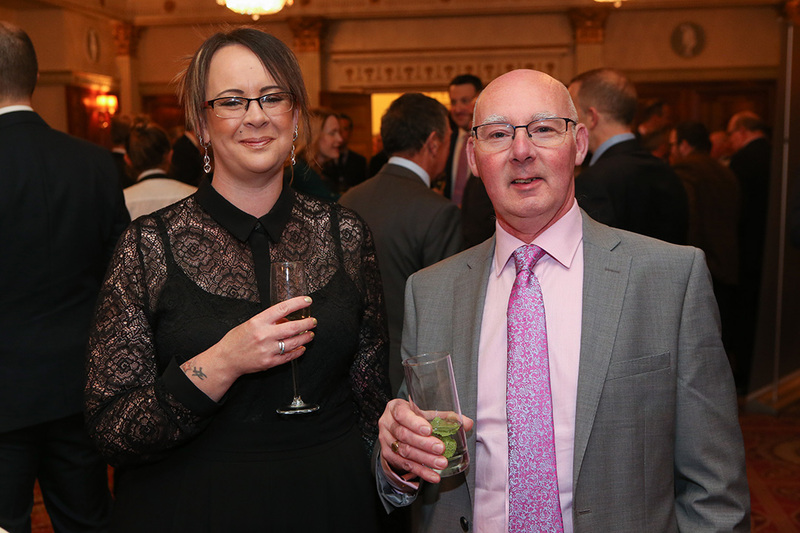 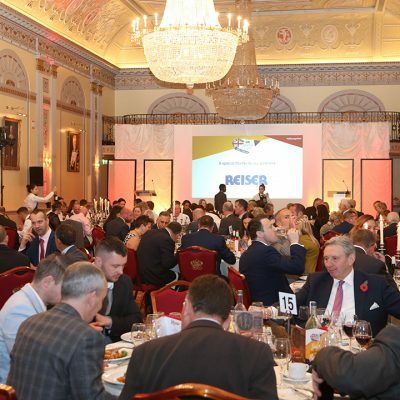 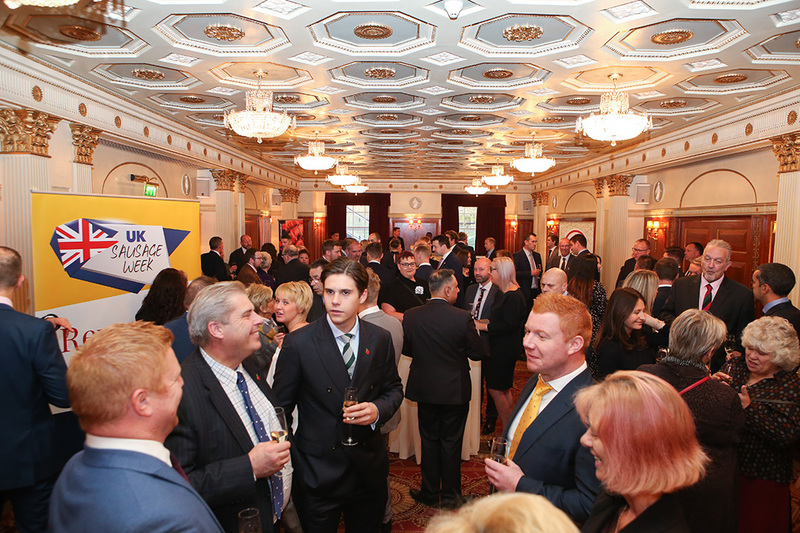 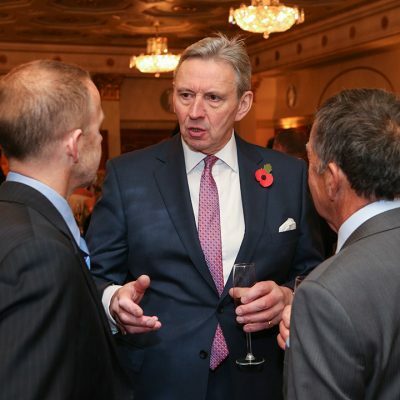 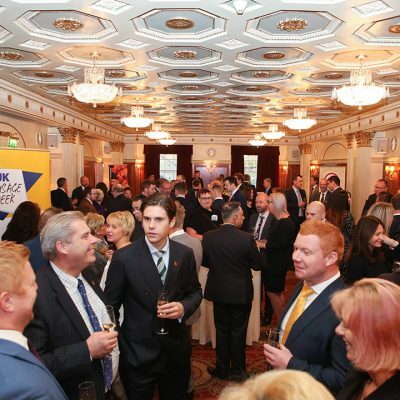 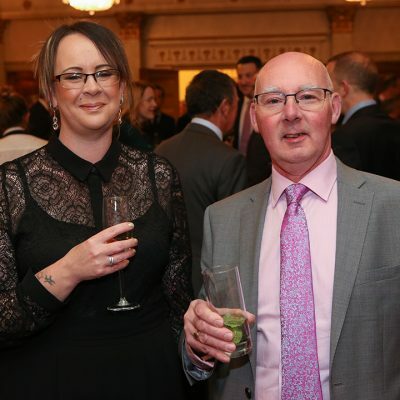 Reiser UK was a category sponsor at our event. 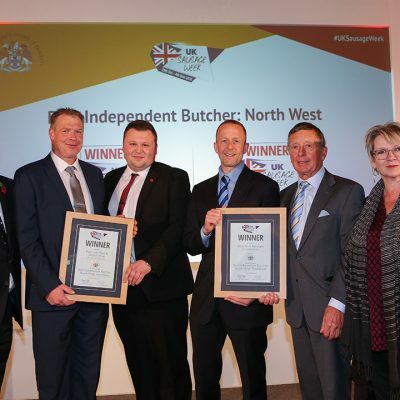 Representatives from Frank Parker Butchers and Owen Taylor & Sons. 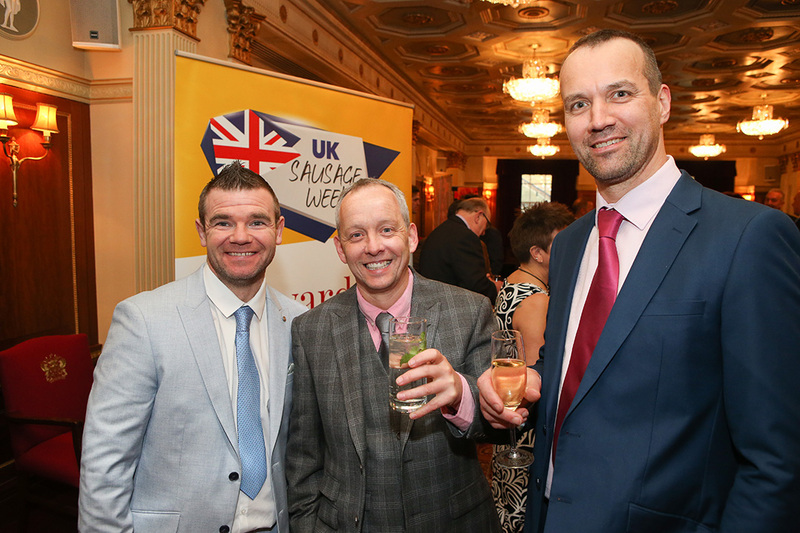 Steve Derrick of Kerry (far right) talking sausages with UKSW guests. 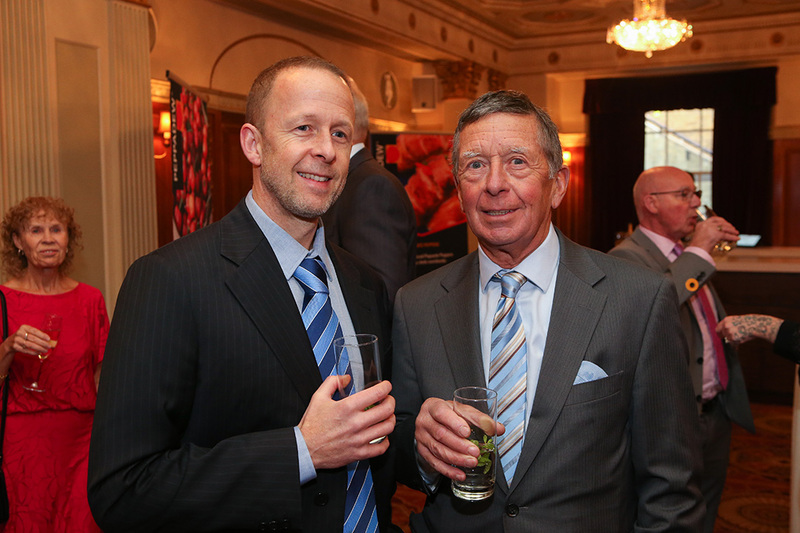 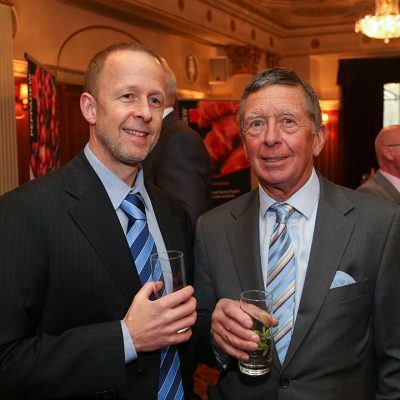 L-R: Howard Callaghan and Gordon Callaghan of G Callaghan & Son. 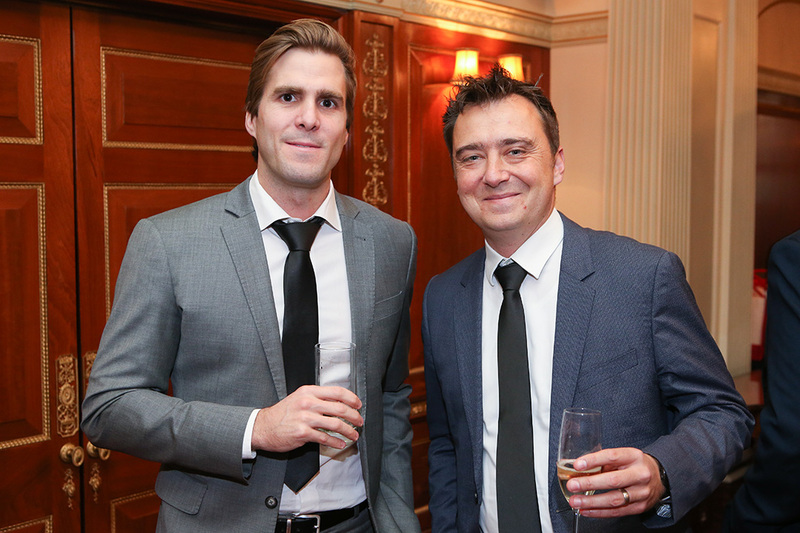 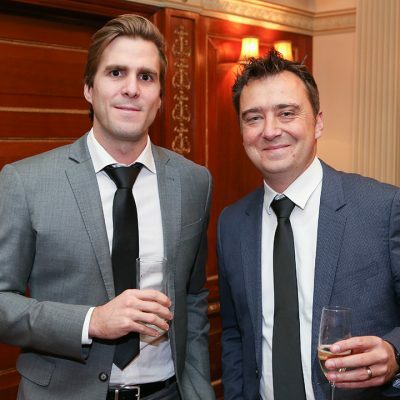 L-R: Rob Hopwood and Lukasz Lubasinski of Peppadew. 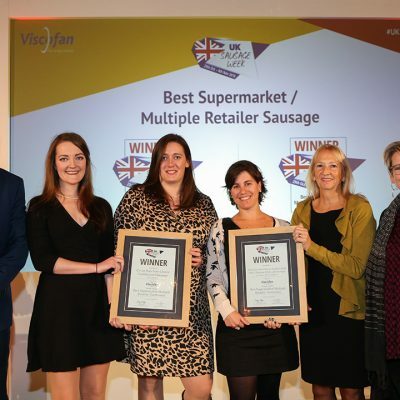 L-R: Fran Barros and Frances Westerman of Walkers Deli & Sausage Co and Waitrose. 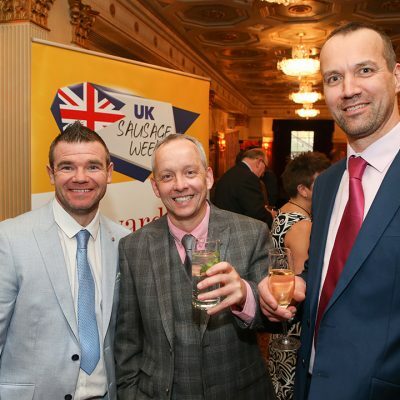 Meat Management director Rob Yandell with Danish Crown UK market director Rob Smith. 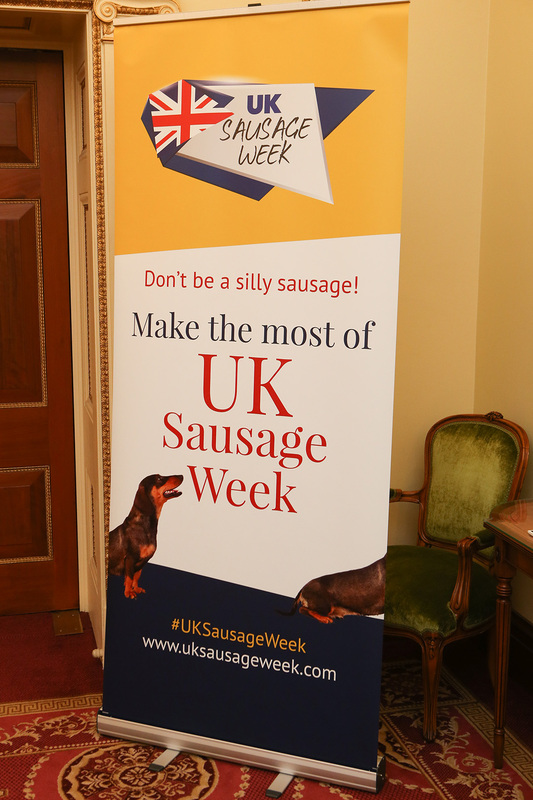 Lots of sausage talk in preperation for the lunch. 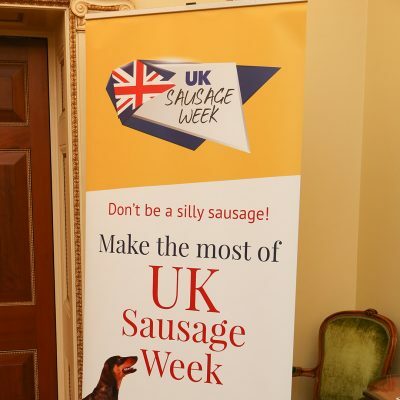 Guests celebrating UK Sausage Week. 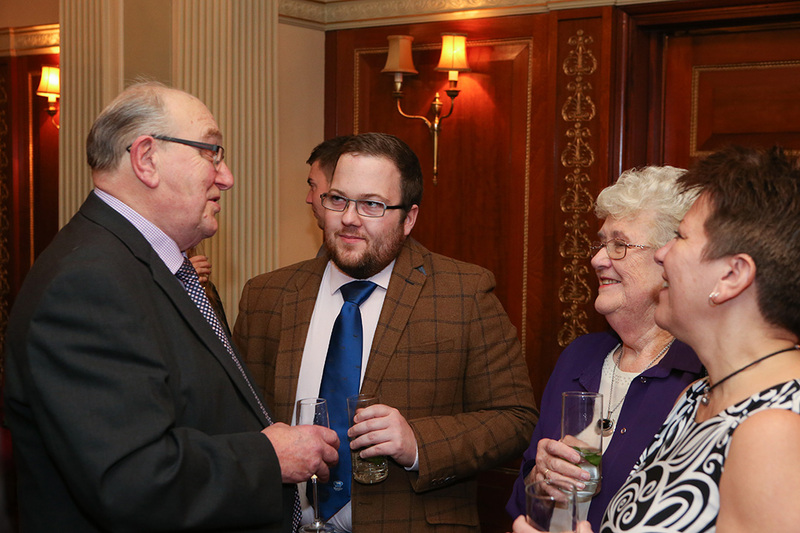 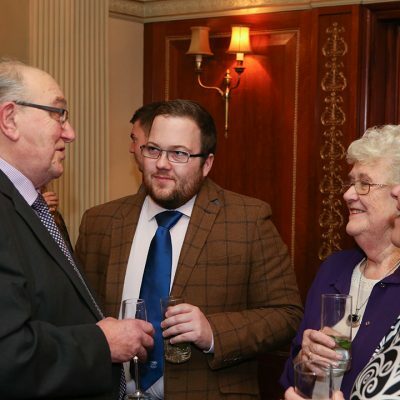 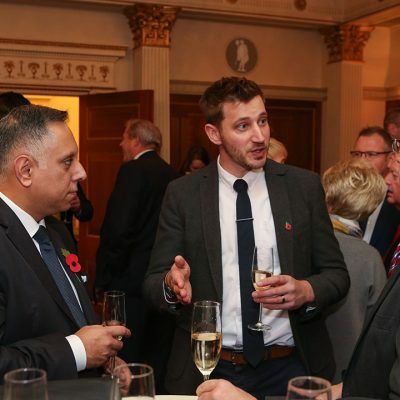 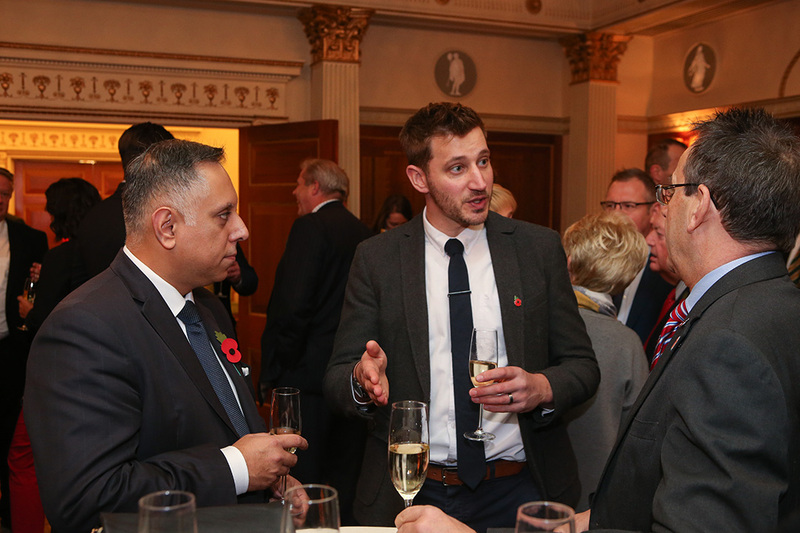 Roger Kelsey, CEO of National Craft Butchers chatting with fellow UKSW guests. 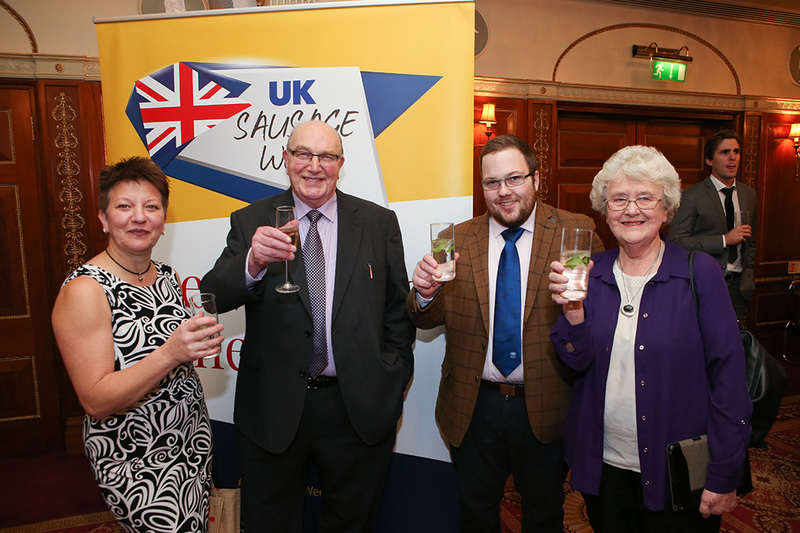 Richard Holloway and Nicola Holloway of Holloway Family Butchers Ltd with fellow UKSW guest. 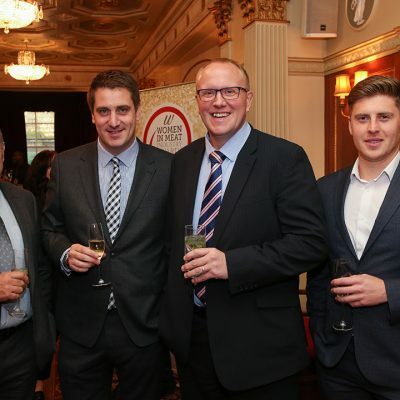 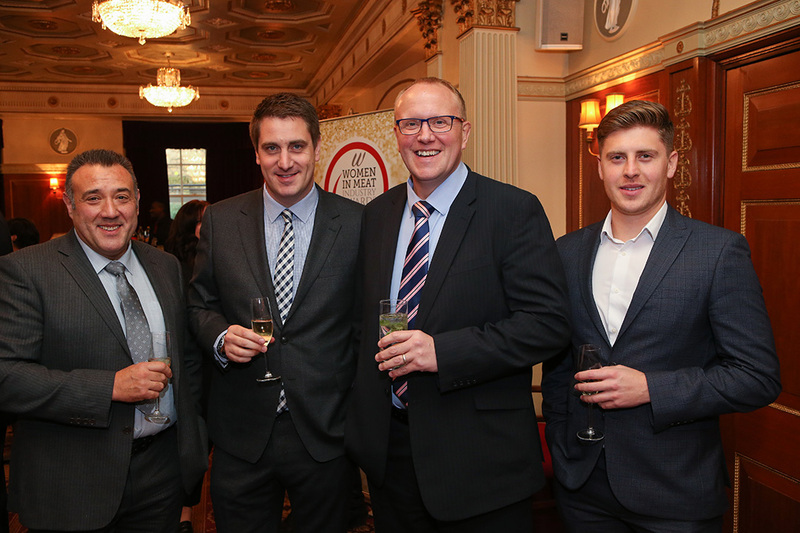 L-R: Andrew Rook of J C Rook & Sons, Colin Mossman, Jonathon Rook and chairman at Institute of Meat Bill Jermey. 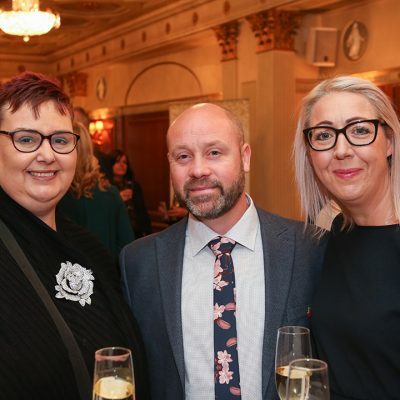 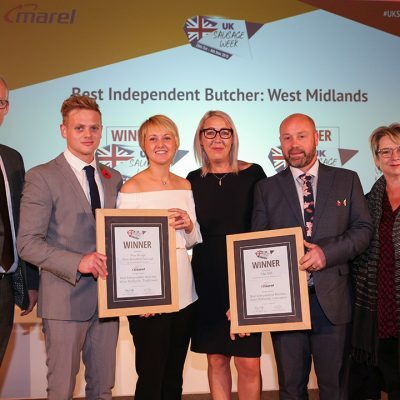 L-R: Stacey Lacey of Meat Management, Harald Bosse and Jensen Bosse of Bosse Interspice, and Emily Farrier of Meat Management. 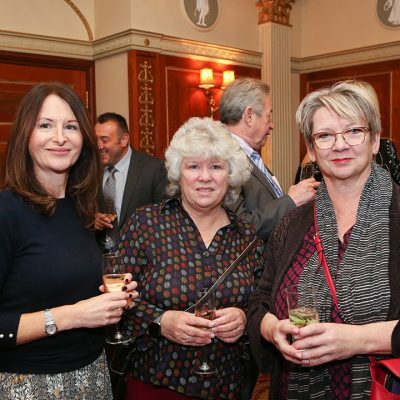 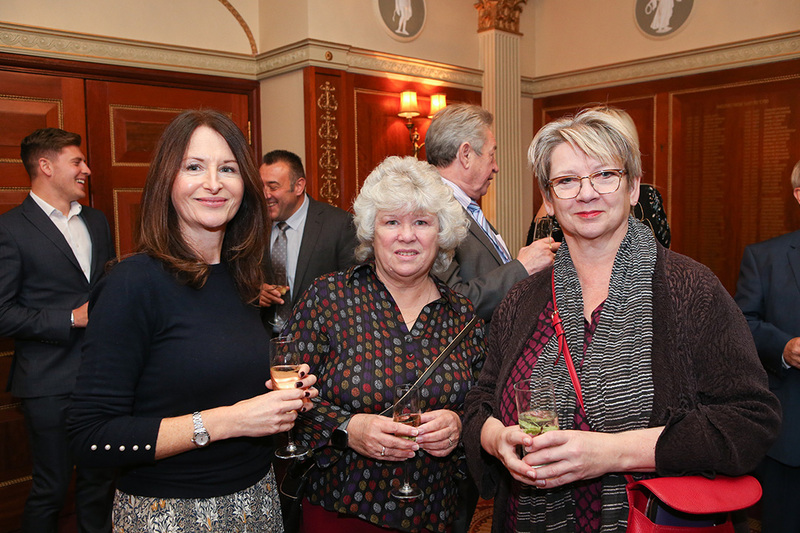 L-R: Sheryl Horne of Institute of Meat, Mary Fisher and Sophie Grigson. 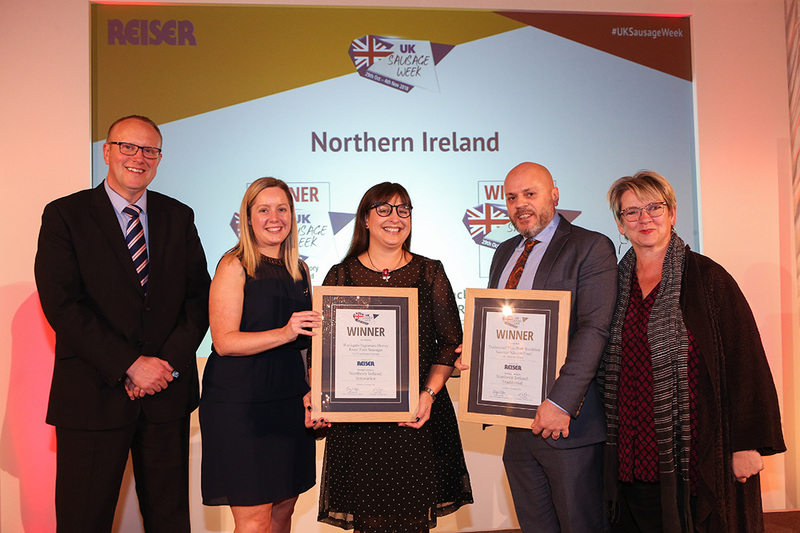 L-R: Innovative winners of Northern Ireland L-R: Kerri Smith of Finnebrogue Artisan and Elizabeth Vint of Booker Wholesale. 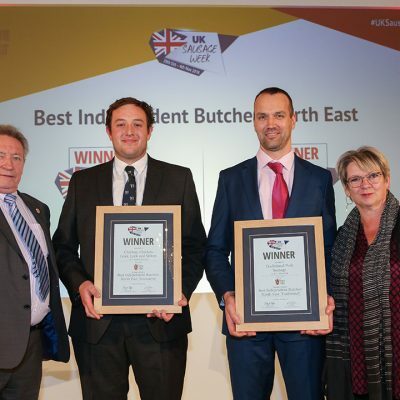 Oliver Weaver of Patrick Strainge Butchers (left) celebrating with James Lally of James of Shepperton Butchers (right). 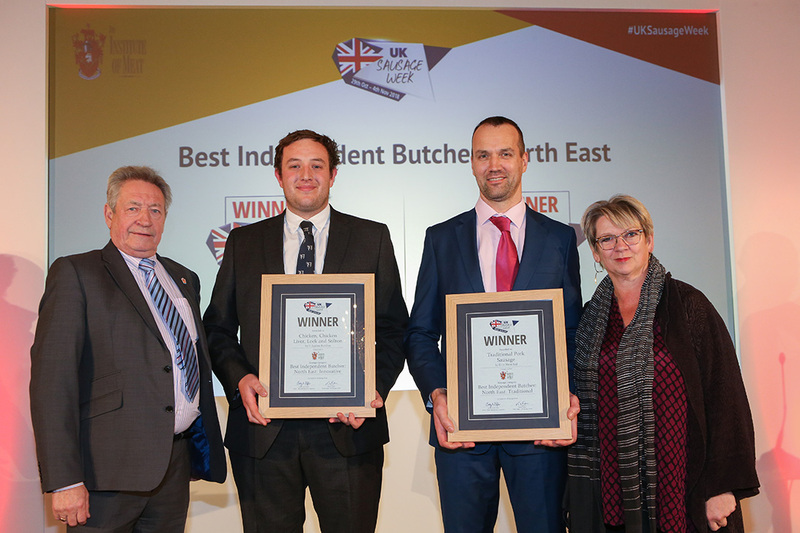 L-R: Michael Magneron and Morris Adamson of Rothbury Family Butchers with Gordon Atkinson of Elite Meat Ltd. 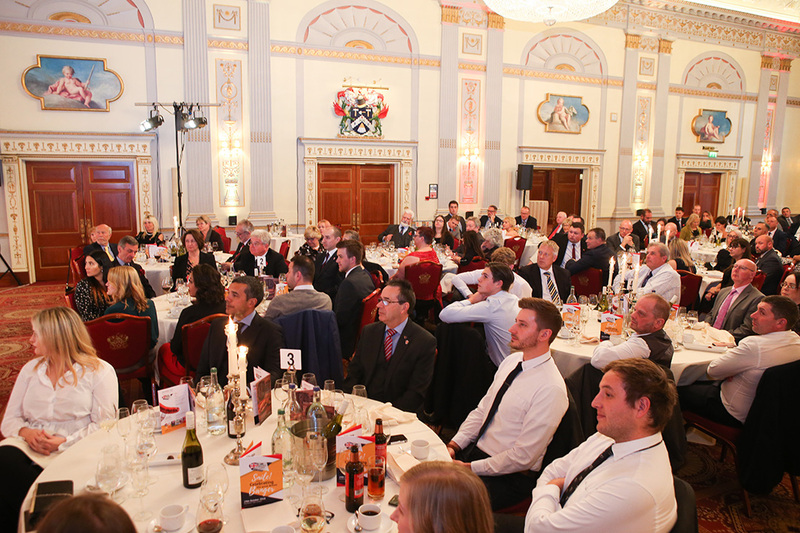 The results are announced in the magnificent surroundings of Plaisterers' Hall, London. 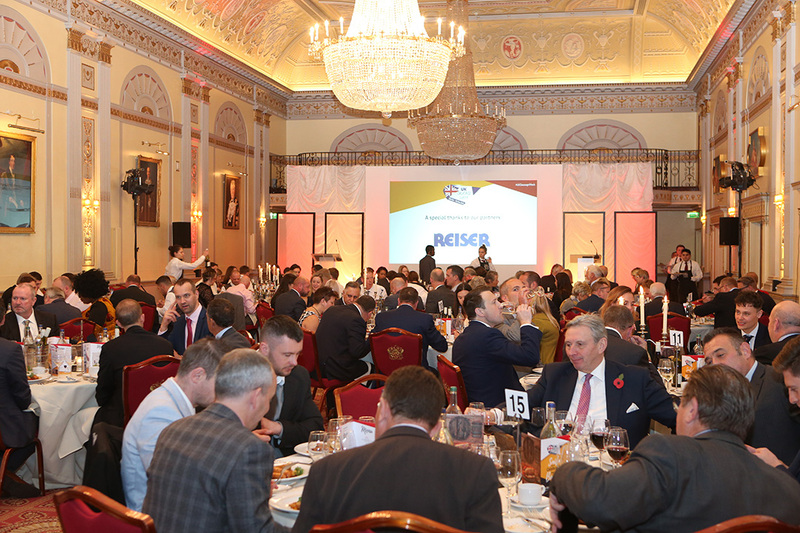 What was for lunch? 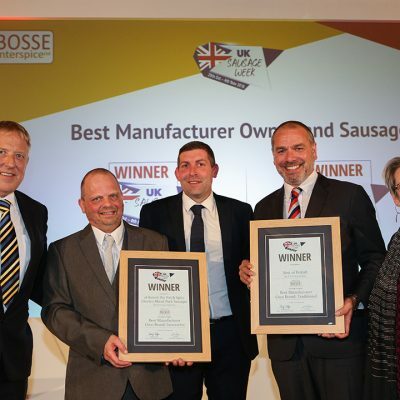 Sausages of course! 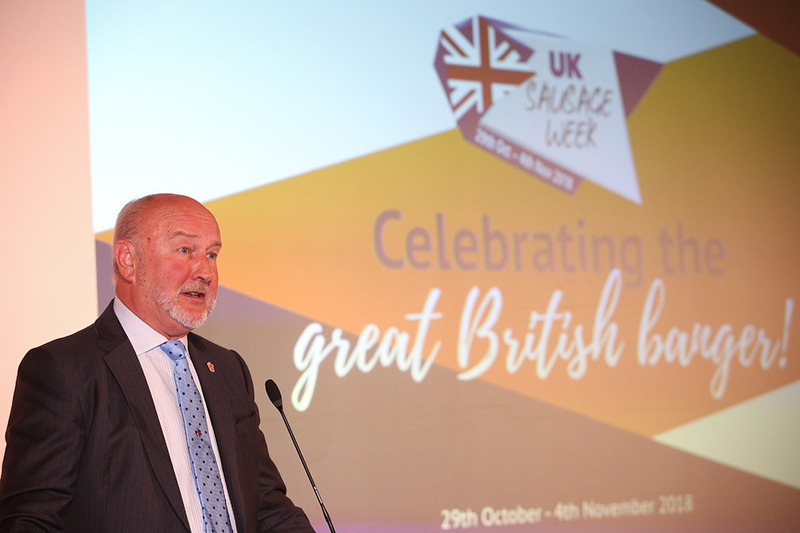 Meat Management publisher Graham Yandell welcoming guests. 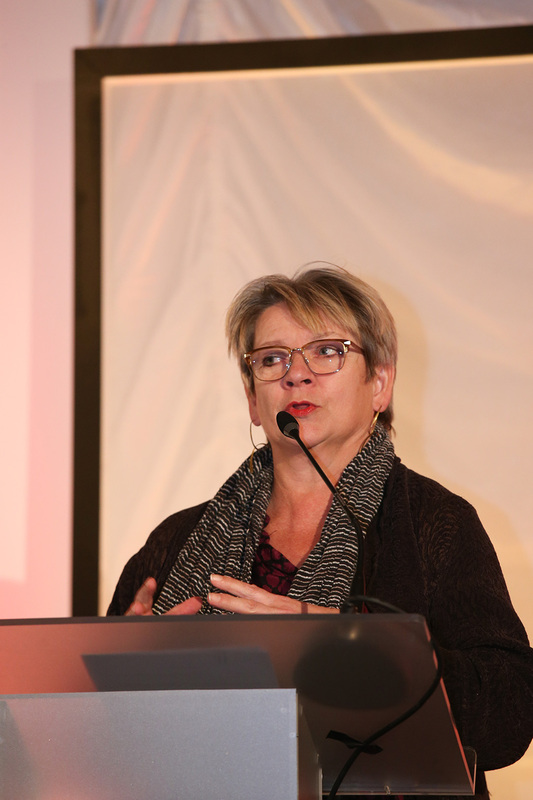 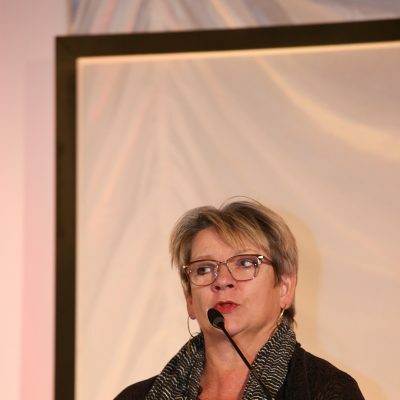 Special celebrity host, chef and food businesswoman Sophie Grigson. 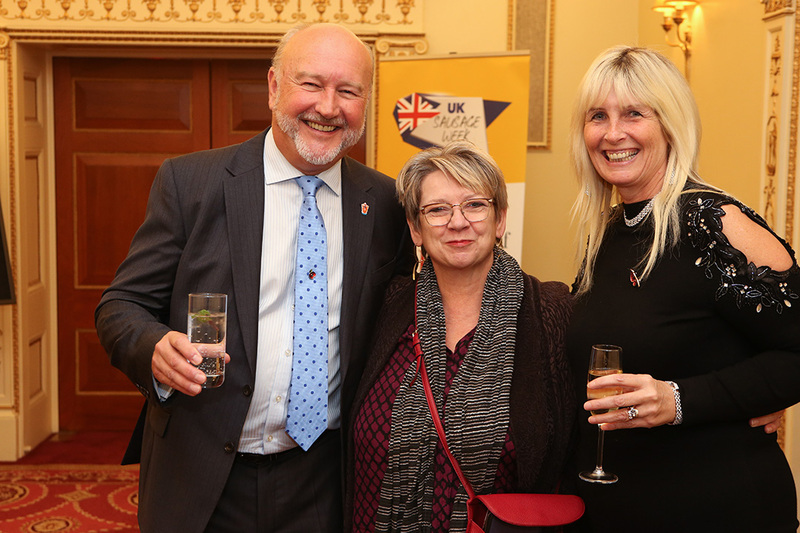 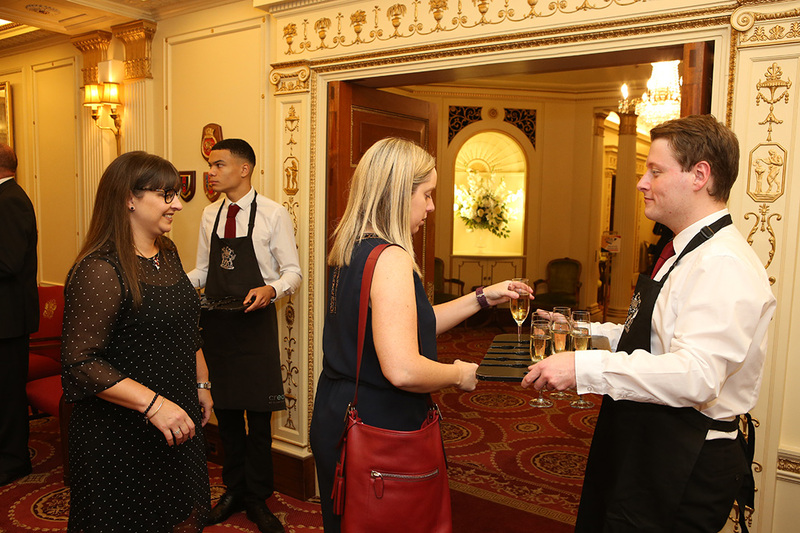 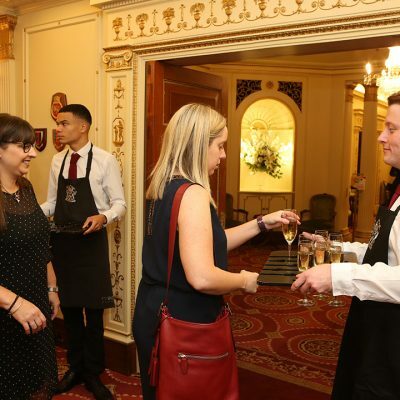 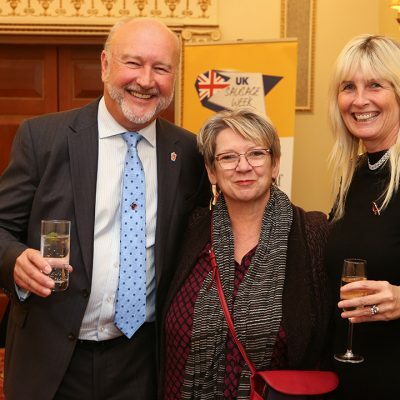 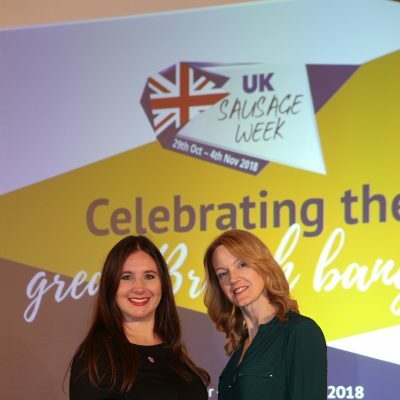 Sophie Grigson was 'delighted' to talk all things sausages to UKSW guests. 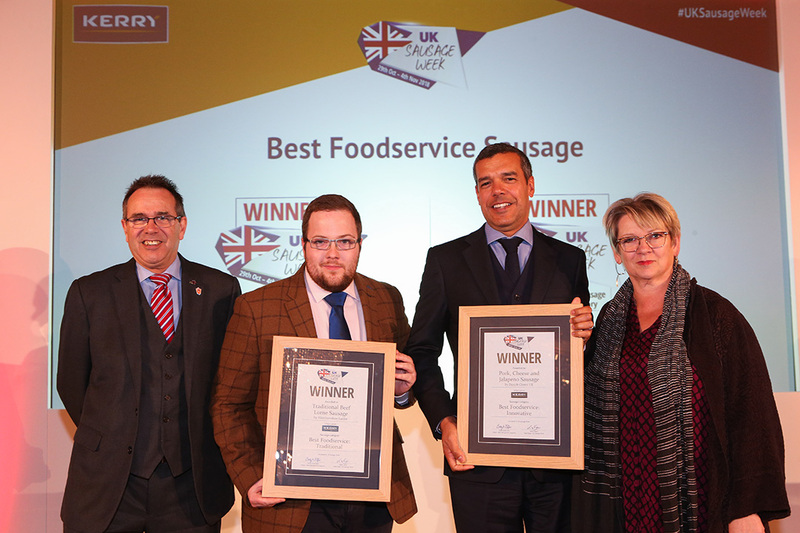 Best Foodservice Sausage L-R: Award partner Steve Derrick of Kerry, Traditional winner Aberdeenshire Larder (collected by Graeme Sharp of The Scotch Butchers Club), Innovative winner James Roberts of Danish Crown UK, and Sophie Grigson. 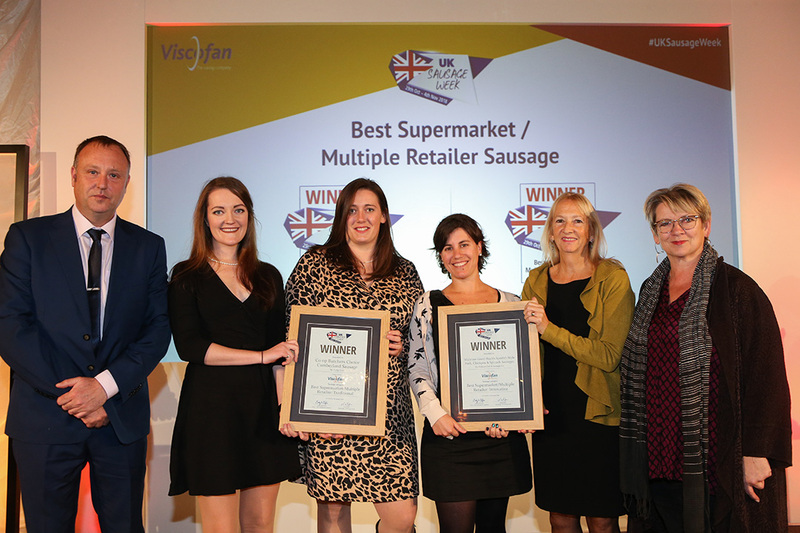 Best Supermarket/Multiple Retailer Sausage L-R: Award partner Paul Wells of Viscofan UK Ltd, Traditional winners Grace Fryer of Co-op and Sarah Varnam of Tulip Ltd, Innovative winners Fran Barros and Frances Westerman of Walkers Deli & Sausage Co and Waitrose and Sophie Grigson. 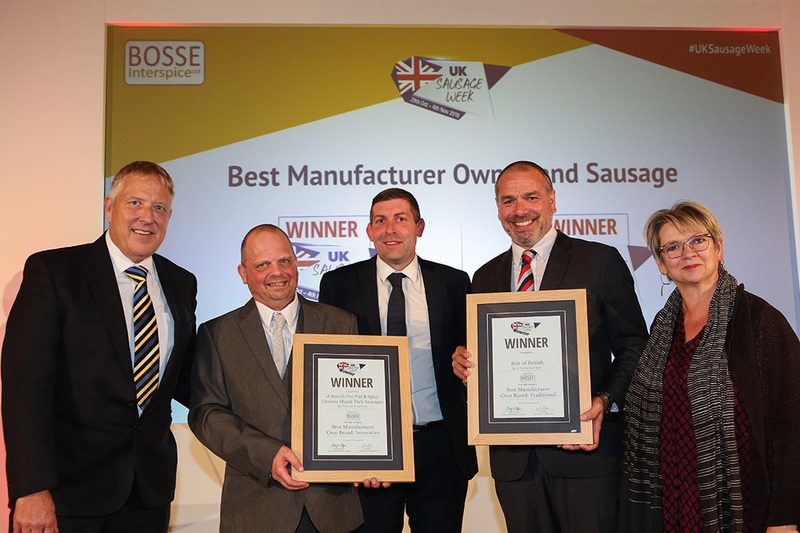 Best Manufacturer Own Brand Sausage L-R: Award partner Jensen Bosse of Bosse Interspice, Innovative winners Simon Ewer and Brad Hill of Riverway Foods Ltd, Traditional winner Paul Turner of A Turner and Sons, and Sophie Grigson. 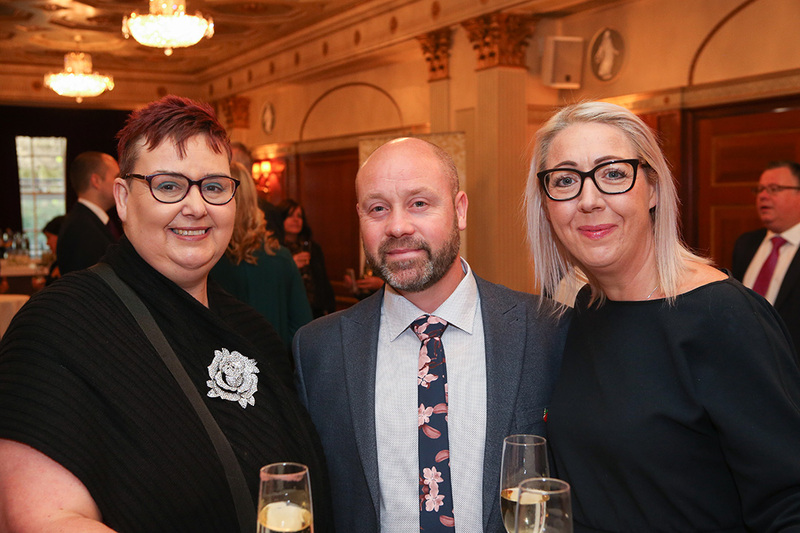 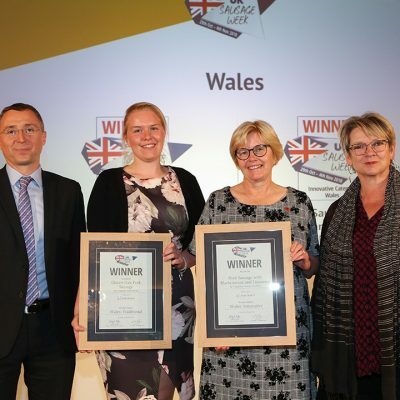 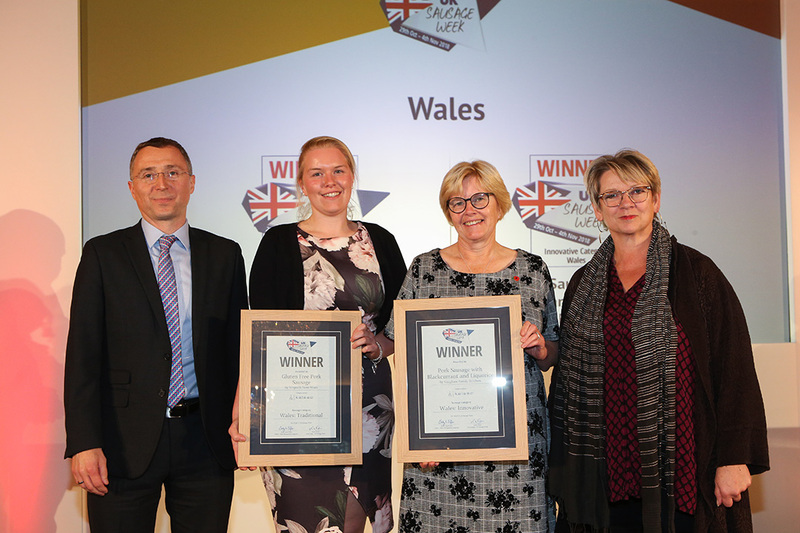 Wales L-R: Award partner Gareth Jones of Kalsec Europe Ltd, Traditional winner Jess Jones of Wegnalls Farm Meats, Innovative winner Helen Vaughans of Vaughans Family Butchers, and Sophie Grigson. 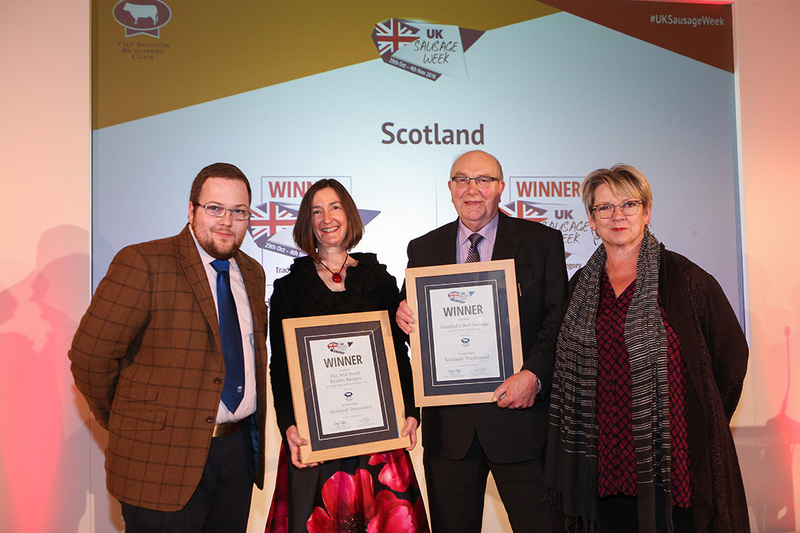 Scotland L-R: Award partner Graeme Sharp of The Scotch Butchers Club, Innovative winner Julia Thomas of Hugh Black & Sons Butchers, Traditional winner Sandy Crombie of Crombies of Edinburgh, and Sophie Grigson. 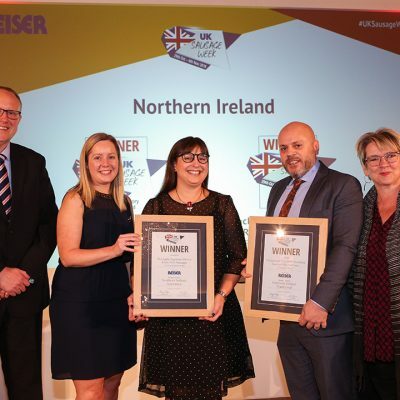 Northern Ireland L-R: Award partner Ed Hewitt of Reiser UK Ltd, Innovative winners Kerri Smith of Finnebrogue Artisan and Elizabeth Vint of Booker Wholesale, Traditional winner David Rosbotham of Hannan Meats, and Sophie Grigson. 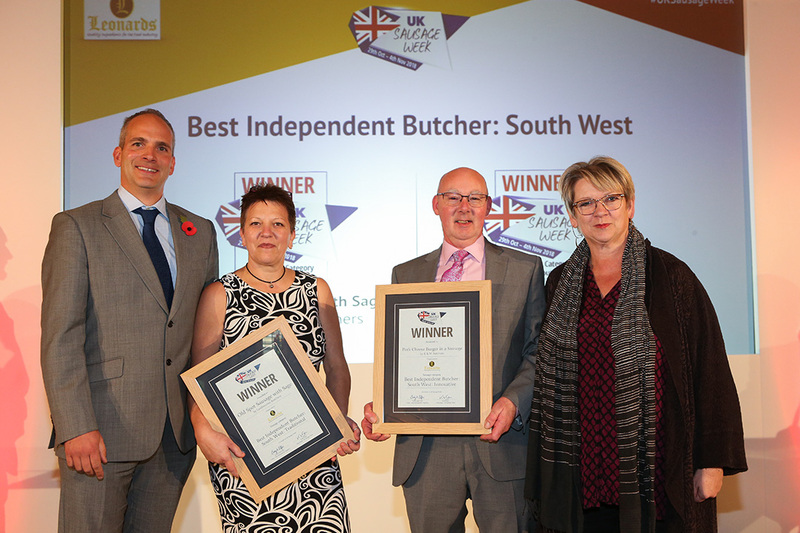 Best Independent Butcher: South West L-R: Award partner John Lelliot of Leonards Ingredients, Traditional winner Janet Pawley of Lambournes Butchers, Innovative winner Kevin Tratt of K & M Butchers, and Sophie Grigson. 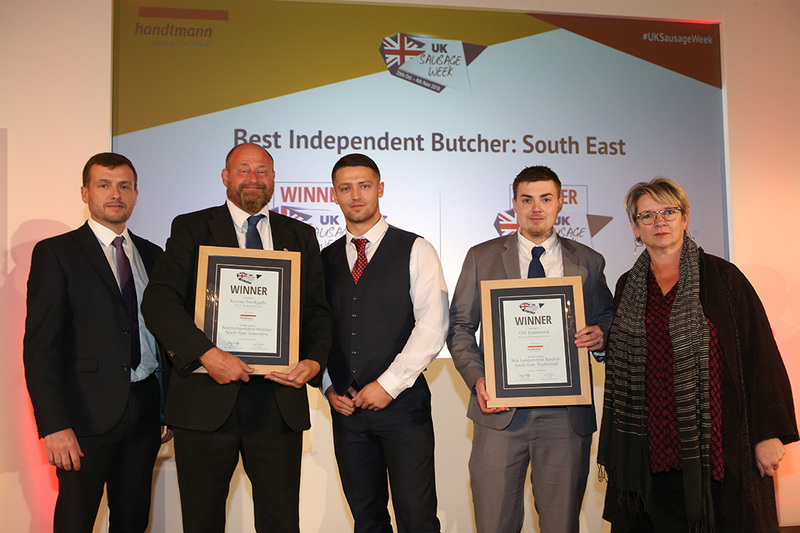 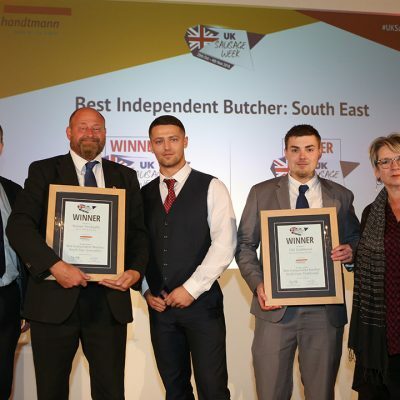 Best Independent Butcher: South East L-R: Award partner Anthony Daniels of Handtmann Ltd, Innovative winners Andrew Rook and Jonathan Rook of J C Rook & Sons, Traditional winner Oliver Weaver of Patrick Strainge Butchers, and Sophie Grigson. 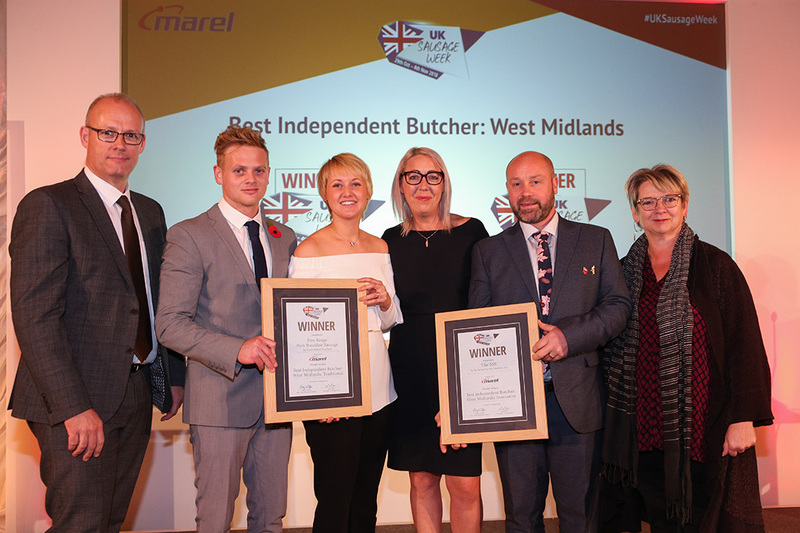 Best Independent Butcher: West Midlands L-R: Award partner Stuart Turner of Marel, Traditional winners George Parker and Hannah Parker of Frank Parker Butchers, Innovative winners Nicola Holloway and Richard Holloway of Holloway Family Butchers Ltd, and Sophie Grigson. 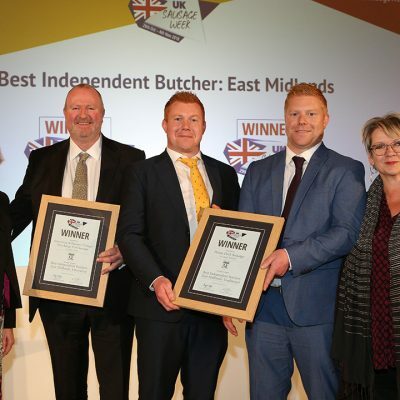 Best Independent Butcher: East Midlands L-R: Award partner Claire Holland of The Q Guild of Butchers, Innovative winner Andrew Edis of Edis of Ely, Traditional winners Ed Armstrong and Tom Armstrong of Ginger Butchers, and Sophie Grigson. 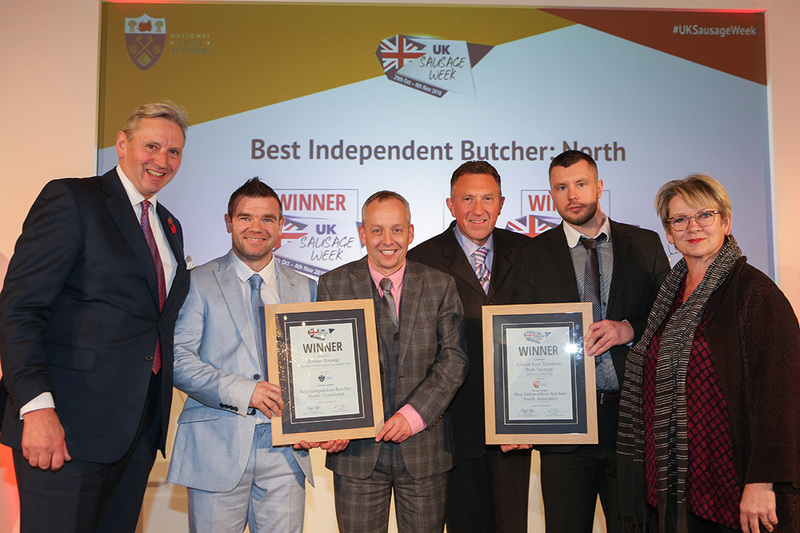 Best Independent Butcher: North L-R: Award partner Roger Kelsey of National Craft Butchers, and Traditional winners Michael Magneron and Morris Adamson of Rothbury Family Butchers, Innovative winners Paul Clark and Stephen Auton of George H Pickings, and Sophie Grigson. 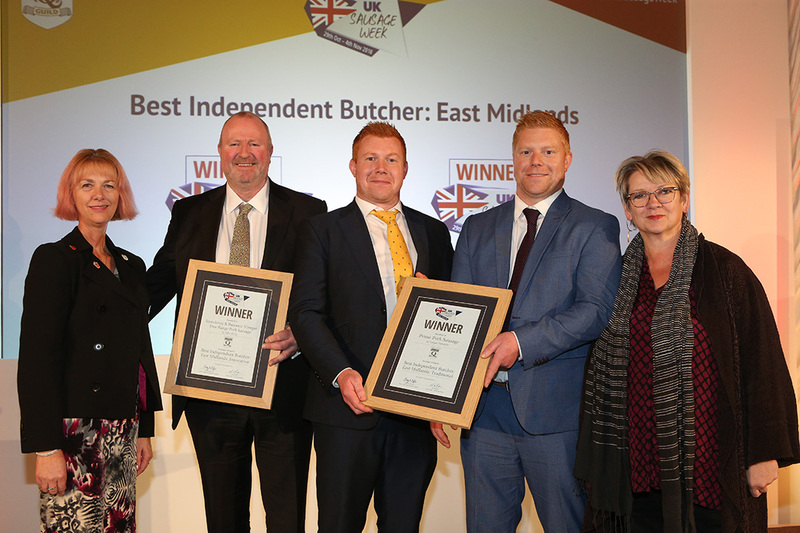 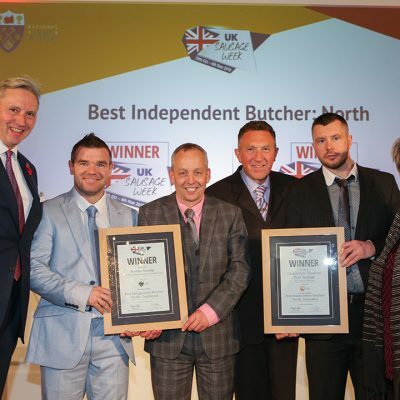 Best Independent Butcher: North East L-R: Award partner Keith Fisher of The Institute of Meat, Innovative winner Thomas Bollon of F. Leakes Butcher, Traditional winner Gordon Atkinson of Elite Meat Ltd, and Sophie Grigson. 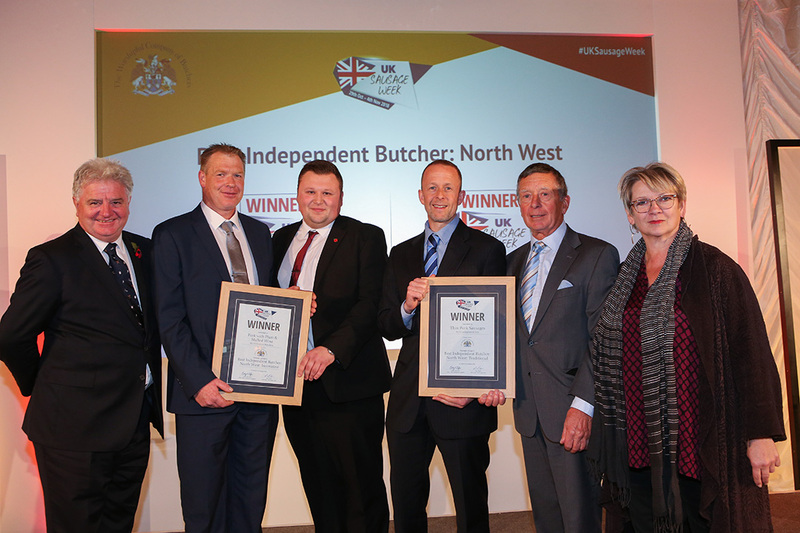 Best Independent Butcher: North West L-R: Award partner Graham Baker, Master of the Worshipful Company of Butchers, Innovative winners Ton Cox and Grant Richards of H Clewlow Butchers, Traditional winners Howard Callaghan and Gordon Callaghan of G Callaghan & Son, and Sophie Grigson. 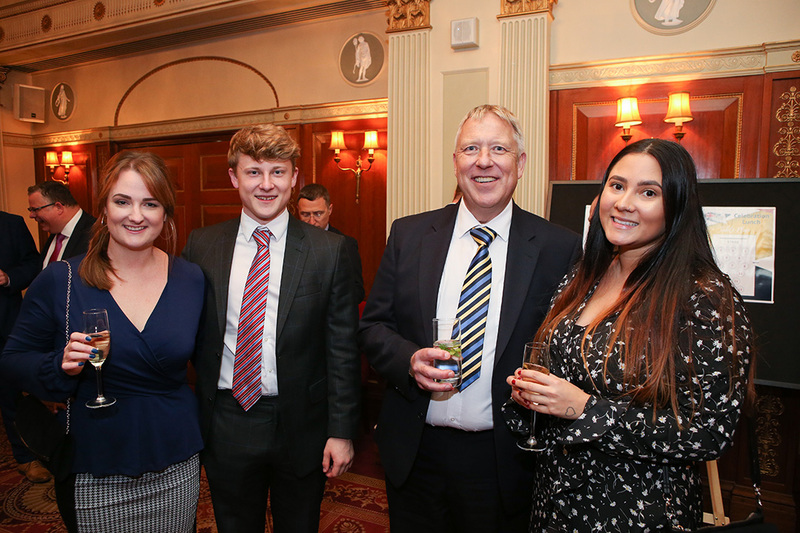 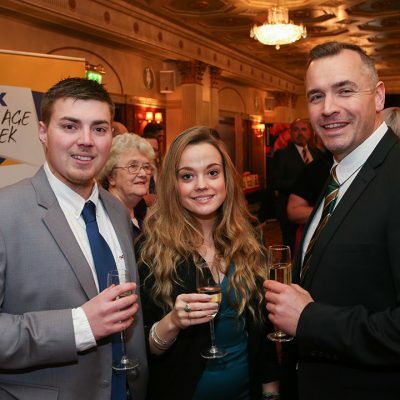 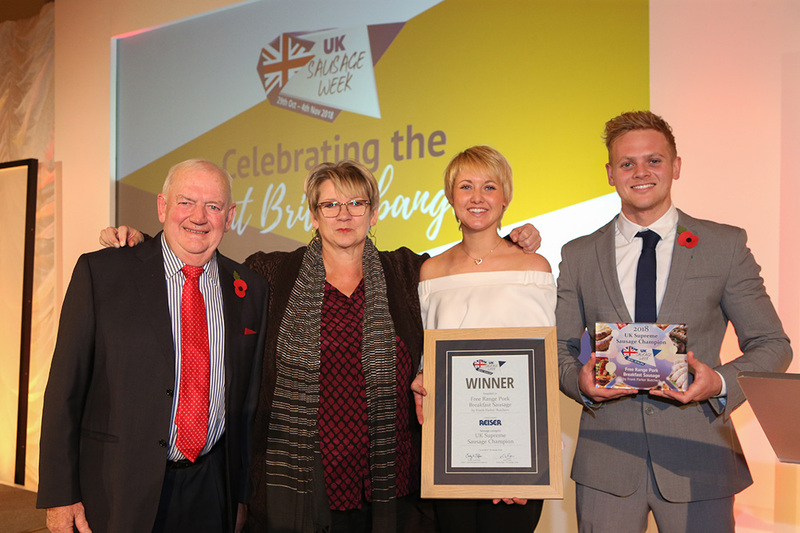 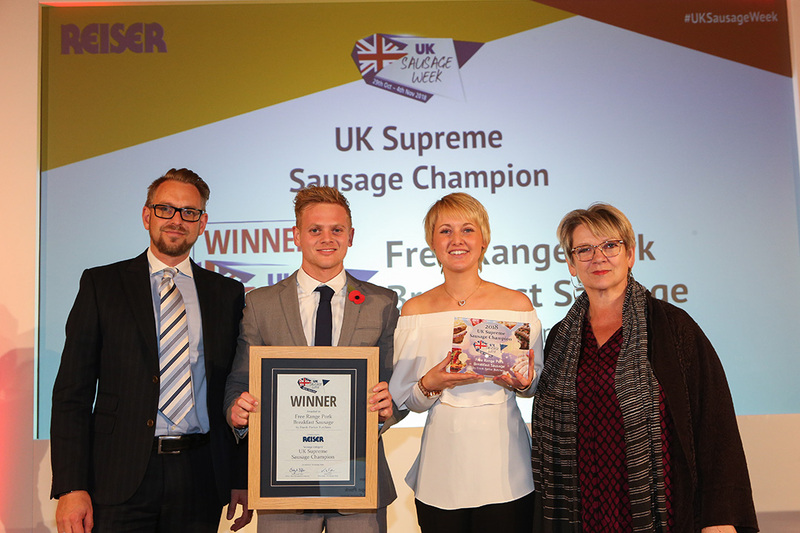 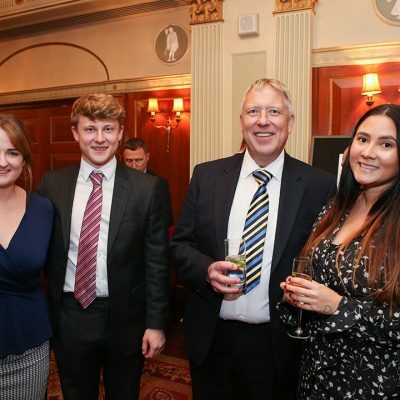 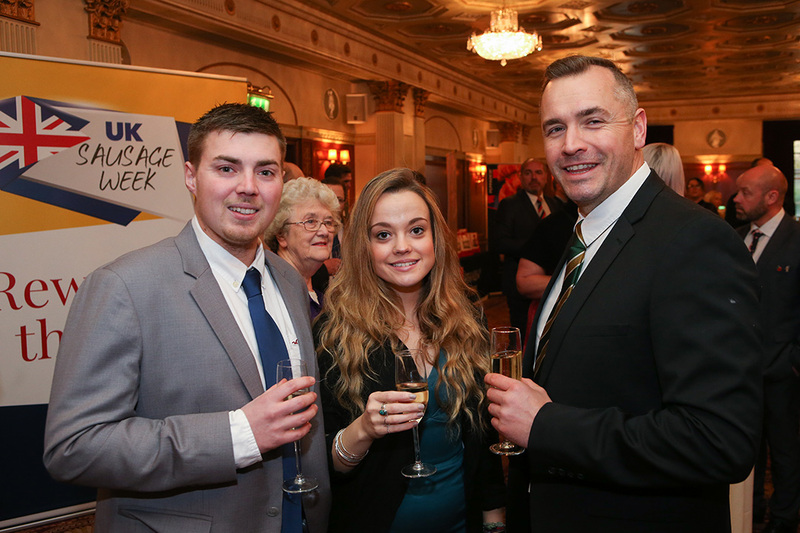 UK Supreme Sausage Champion L-R: Award partner Richard Watson of Reiser UK Ltd, winners George Parker and Hannah Parker of Frank Parker Butchers, and Sophie Grigson. 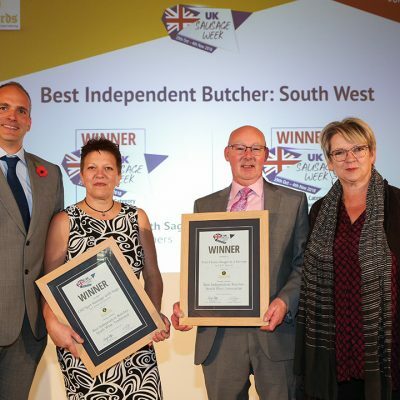 The Frank Parker Butchers family with Sophie Grigson. 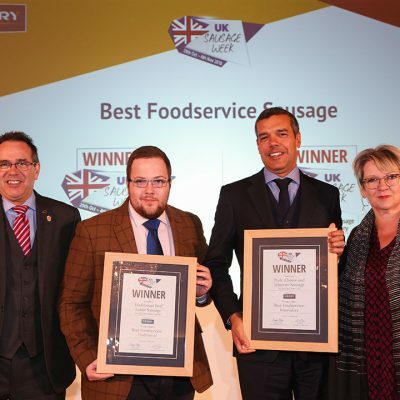 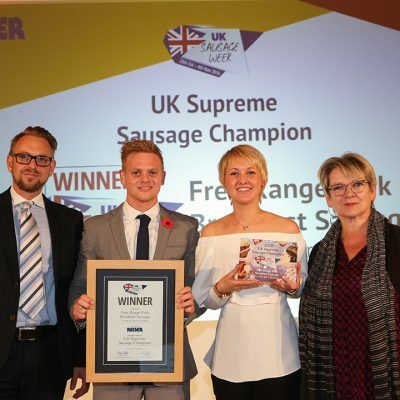 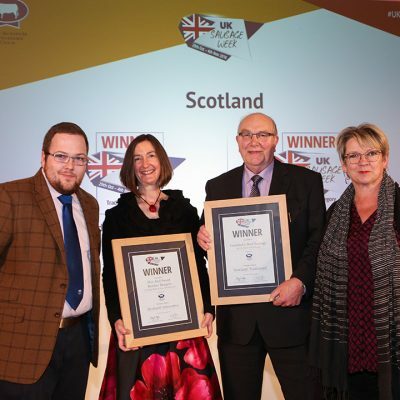 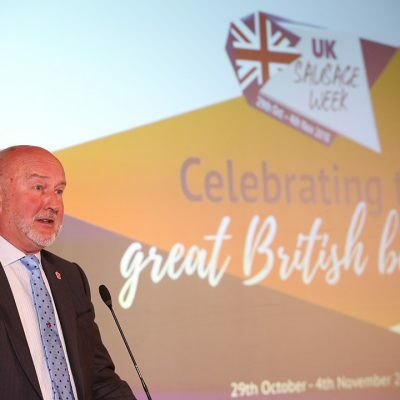 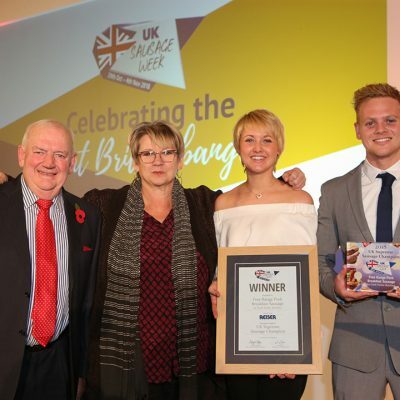 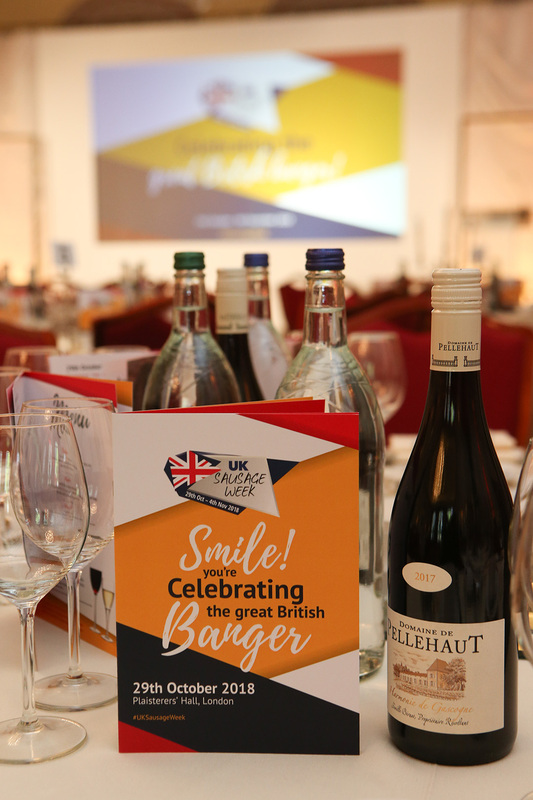 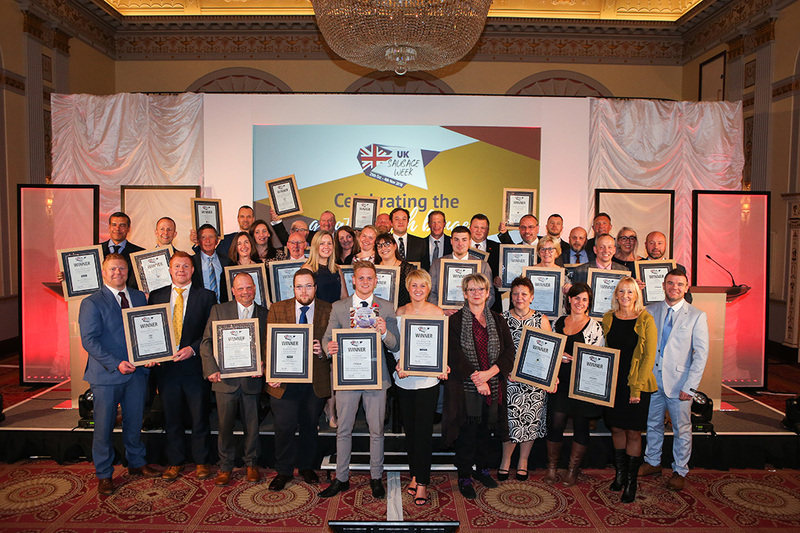 The 2018 UK Sausage Week award-winners. 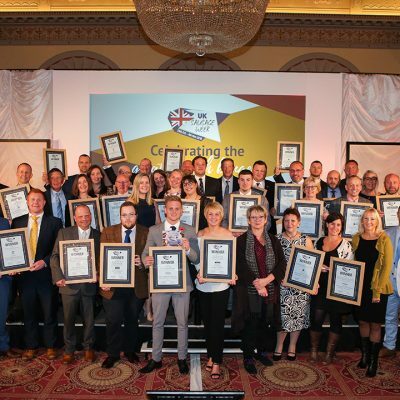 To see the full 2018 roll of honour, click here.